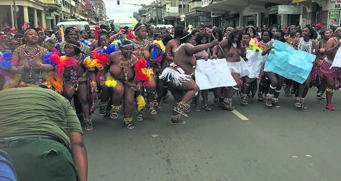 HUNDREDS of maidens from different parts of KZN marched to the office of Premier Willies Mchunu on Wednesday. They said they were there to show their anger over a UN statement last month calling for virginity testing to be stopped. Thokozani Ngcobo (27) said the UN didn’t even consult them. “We are here to send a message to the government that we will shut down South Africa if they ban virginity testing,” she said. Slindile Ngobese (23) said she was part of the march to fight for her rights. “We are here because it is our choice to participate in virginity testing,” she said. Cultural expert and virginity tester Nomagugu Ngobese said they would continue with the practice. Ngobese said the UN should be focusing on serious issues like domestic violence, the distribution of condoms at school, teenage pregnancy, abortion and an increase in new HIV infections. Siyabonga Mnqayi from the office of the premier accepted their memorandum. “The premier is also championing social cohesion programmes. “On his behalf, we accept this memorandum with warm hands and we promise the premier will make sure it reaches the hands of the president,” said Mnqayi.